Achimenes are perennials native to Central and South America, related to african violets and gloxinias. They are known by numerous common names, including Hot Water Plant, Magic Flower, Orchid Pansy, Widows Tears, Nut Orchid, Mothers Tears, Cupids Bow and more. Blossoms are open funnel shaped and come in a variety of jewel tone colors. The most widely grown and known is a purplish sapphire blue, but there are many other colors available in species and hybrids, ranging from nearly pure white to pink, violet and purple, as well as some rose and newly developed reds. There are some yellow cultivars, but they don't seem to have the vigor of the traditional purples or blues. The foliage is lush and herbaceous in texture, having a soft down on the top side of the leaf and mostly smooth and pink on the veined underside. Bloom is profuse, especially so in the hybrids, and can almost completely cover the foliage when grown in optimum conditions. Achimenes are considered a summer-flowering 'bulb' and are mainly grown as pot plants or in hanging baskets. The 'bulbs' are actually small, scaly rhizomes that don't look anything like a bulb - they look more like miniature pink pinecones. These rhizomes, which measure from 1/2 to 1 inch long, can be broken into smaller pieces at planting time to produce extra plants. You can also propagate your achimenes from stem cuttings of firm shoots in mid-summer. Place cuttings directly into a flat or pot of moist seedling mix, keep in a medium light area free from drafts, and they will develop roots within 10 to 20 days. Propagation by seed is another method, but we will leave that to the experts. They may be grown outdoors in Zone 10 and the warmer areas of Zone 9 where night time temperatures do not fall below 50� F during the growing season. 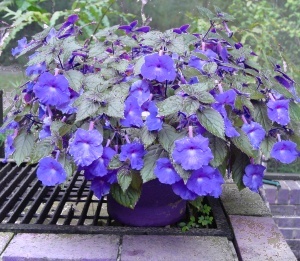 Under such conditions, they can be left in the ground year round in a planter on your porch or a partially shaded area (achimenes will not tolerate full sun) in your back yard garden to multiply and provide wonderful splashes of blue and purple color during the summer. Plant in early spring in good soil fortified with humus or compost, in a well-drained location. The rhizomes should be planted about one inch deep and 4 to 5 inches apart. Keep soil moderately moist until growth appears in about 1 to 3 weeks. Achimenes should not be allowed to dry out during the growing season. This would cause the plants to start their dormancy period and once at that point, you can expect no more bloom that season. If you are in a colder region of the country, you can easily grow your achimenes as houseplants. As potting medium, you can use african violet mix which is widely available in local plant nurseries or home improvement centers. It is important to provide bright filtered light and high humidity. They will also do well under grow lamps. While growing and blooming, always keep the soil on the moist side (but not soggy). You can pinch back the tips before flowering commences to induce a more compact plant and encourage more flowers. Indoors or out, achimenes benefit from fertilizing every 2 weeks or so during the growing season. Use a water soluble plant food at half strength and apply early in the morning so that any moisture can evaporate before the sun has a chance to burn the foliage. Achimenes are sensitive to wet foilage and will develop ugly brown spots when 'burned' by the sun. You can relax watering in early fall when it becomes obvious that the plant has done it's best, flowering ceases and the leaves begin to curl and dry out. During this period when the foliage begins to dry and finally die, the underground rhizomes 'ripen' and mature. Once the remaining stalks are completely dry, you can dig and harvest the rhizomes if you are in a cool climate and the plants have been growing outside. Store them in a dry medium such as peat moss or vermiculite and keep over winter in a place where temperatures do not drop under 50� F. They can then be planted outside again the following season. If the plants are inside, you can just leave them in the pot, curtail watering to about once a month and resume regular watering in the early spring. Once new growth is about 3 inches high, begin your fertilization schedule. In either growing environment, achimenes are low-maintenance, perfectly recycleable little gems that will reward your care with spectacular shows of bloom year after year.